He knew their kind were just like Him, and needed kept busy. And gave’em hands to operate, on the problems that they find. When the sun arrives each morning, there are many works in store. In every weather pattern, in snow and burning sun. Stretched barbs on wire, stacked hay a-many load. They’ve worked from dawn to dusk, they’d hate to slow down some. Planted posts to keep his stock from rangin’ the country-side. Steady work with a rifle, unfaltered by his work. Keep their family fed, in clothes and under roof. Remains in them power to act, to work and pen a rhyme. My grandfather ran about 15 head of cattle when I was growing up. I realize that’s not much to many, but it was the closest think I knew to a ranch. Around most of his acreage ran a single strand of electrified barbed wire. This hot-wire ran through some pretty nasty terrain in some places, so every night it was necessary to do a once around to check the fence. Some nights, if I arrived at just the right time, I would get to go up and water the cows and check the fence with him. Grandpa for years made tires at Goodyear and ran some cows. Both jobs were very hard on hands. I was always amazed at the way he could manhandle barbed wire, stick a post in the ground, out muscle the water trough, and twist balin’ wire. His hands were the roughest I had ever seen. I still remember him, wrenching loose staples, wielding a hay hook, and twisting wrenches. Grandma kept a dried out bar of lava soap next to the sink that Grandpa used to wash his hands…it hurt my soft hands to use that rough soap. In his hands was the capability to tackle any job. The last post discussed the differences n the names of God (‘elohim v. Yahweh). ‘Elohim testified to Creator and Power, whereas Yahweh spoke to the personal, relational God who was in regular contact with his people. It is the personal relationship Yahweh had with his people that caused the authors of scripture to speak in poetics and ascribe to Him human attributes. To be fair, ‘elohim is occasionally linked to physical characteristics, but not nearly with the regularity of Yahweh. One of the major attributes to Yahweh are His hands. The hand [hb. yad] of Yahweh showed the Lord’s power in action. Without equal, the biggest event in Hebrew history was the Exodus. The night that a nation of slaves walked out of the greatest nation one earth, carrying their wealth, and taking from them their honor (Exodus 12.31-42). That night was special. That day of victory would be remembered for generations. Every year the Israelites would celebrate the night that they routed Egypt, became their own people, with their own identity, because of the work of their God, the work that He accomplished with His own hands. When Israel was to celebrate this day, it was for one reason: to remind them that the Lord brought them out of Egypt with His mighty hand. (Ex. 13.3, 9, 16) When their kids ask what the celebration is for, the Israelites can tell them about the mighty hand of God that brought them out of Egypt (Ex. 13.14). The hand of God is God’s power in action in the lives of His people. Four times in 13 verses, God’s hand is at work, actively involved in bringing the people out of Egypt. There is no way they could have done it on their own, but the hand of Yahweh is more than capable. The Hands of Yahweh are never idle. It was His hand that brought the plagues upon Egypt (Ex. 6.1). His hand would be so heavy, so mighty in dealing with the Egyptians, that Pharaoh would drive them out of the country. In the same way that God will force out the Canaanites before Israel, Egypt will so badly want to be done with them, that they will drive [hb. Garas] them out of Egypt. It is God’s activity that will bring about the event that would forever be remembered as the greatest act in the history of the people. Yahweh’s hands, His power in activity, brought the Israelites redemption from the land of Egypt (Deut. 7.8). But 1500 years later it would be Jesus hands, pierced by nails, that would provide for our redemption. Jesus hands held him on the cross to pay for our sins. It was the Lord’s power in action by sending Jesus that would provide salvation for us today. The hands of the Lord, a picture of His ability and activity, would save his people from slavery in Egypt and our slavery to sin. (Rom. 6.6-7) God has the power to work in situations we deem hopeless, the ability to accomplish things we never can imagine, and the strength to act where we can’t. Is there a time when you have seen the Lord’s hands and his power in action? What thoughts come to mind when you think of God’s power? Daniel Unruh at the CYRA Finals taking a shot for me. Where do you fall in the hierarchy? There are a couple guys I know who choose last place as a career. Men like Daniel Unruh and Lucas Littles, Cody Webster and Dusty Tuckness. Jesus points out the place we should take in relationship to God and others. Jesus tells the teacher: Mission—Men—Me. We take last. In the video above, Daniel Unruh chose last. Jesus tells the teacher is that we are to “Love the Lord your God with all your heart and with all your soul and with all your mind and with all your strength.” This is our primary function, our mission if you will, as human beings. We were created to love God and be in relationship with Him. Daniel’s mission as a bullfighter is to keep the bullrider safe. 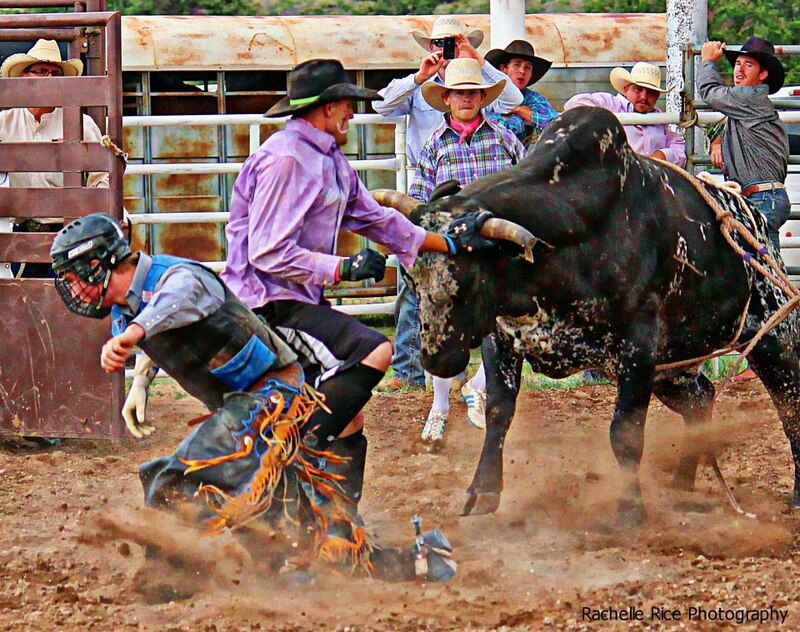 Daniel, in the purple, is seen twice trying to get Jess Pope’s hand out of the bull rope. Twice he wades in there to grab the tail and pull. Daniel’s first mission is to protect the bullrider. The second thing Jesus tells the teacher is to love other people (31). He says, love the men (and women) around you! We do this by serving those around us and bearing each other’s burdens. I am in the dark blue shirt in the video. As I was laying infront the bull, I looked up to see a set of horns coming at me and then a flash of purple. Daniel had placed himself between the horns of the bull to take the shot for me. The second purpose, after protecting the bullrider, is to protect the other men in the arena. Some times it’s a gate man, the other bullfighter, a pick up man or barrel man. Everyone else in the arena are the bullfighters responsibility as well. Jesus spoke these words the night he would be betrayed. The night that he showed the disciples the full extent of his love (John 13.1) and told them to copy him (13.34-35). Jesus chose last! It was in the garden he prayed: “God, not what I will but what you will.” (Mark 14.36) Jesus stayed on mission following God to the cross. He came behind his men, as he came “not to be served but to serve and to give his life as a ransom for many.” (Mark 10.45). He gave up the himself, on the cross. “With a loud cry, Jesus breathed his last.” (Mark 15.37) In the hierarchy, he chose last. As you go through the day, how often do you live in first place, choosing your way instead of God’s? How often do you get off-mission? How may times are you serving others? Holding a door open? Taking the trash of another? Letting someone ahead of you? inconveniencing yourself to convenience others? When do other men come before you? How often does “me” choose last? 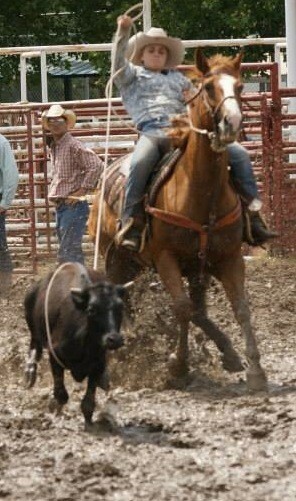 I have tried to rope on numerous occasions and each time looking worse than prior. My method of roping is run the calf until it gets so tired that it stands still enough for you to place the rope over its head. For the record, it wont win you many ropings to do it that way. To throw a good loop is one feeling that has eluded me thus far in my life. I’m pretty sure that my form is so bad that no number of Roy “the Super Looper” clinics could straighten me out. For one thing i don’t have the attention to detail that I see most ropers have. The best seem to have a little OCD to them that I am lacking. The saddle needs to be just right, or their hat, or shirt, or glove, or [insert any other piece of equipment they posses], which for the money some of them rope for makes complete sense. Usually about the time I release my loop, is when I begin checking the rope. I will see a kink, or knot, or twist to it that renders my lasso completely useless. I have a booger of a time keeping my honda right, my spoke adjusted, my coils held, and my loop built all while trying to ride (I was just not made to do that many things at once). But as I said, I never catch these things at an opprotune time, but as the loop is traveling adjacent to my horses head or hovering above my target. The issue is simply that my rope was plagued with imperfections which caused it to become useless. Hebrews 12.1 says: “let us throw off everything that hinders and the sin that so easily entangles…” (gk. euperistatos) Tangles, knots, kinks, all of these things can happen to a good rope if care is not taken. These issues get in the way of the rope doing what it was meant to do: catch calves. When Hebrews talked about being entangled, perhaps you thought of an extension cord, christmas lights, or a fishing line. My first thought was the calf rope that rides around in my pickup. It has been everywhere, sat on by kids, roped with, stepped on and everything else. It is completely useless as a calf rope now. The problem is that in Genesis 3, when sin entered the picture all of these things got flipped upside down. The very things that we were created to do was hindered by our disobedience to God. 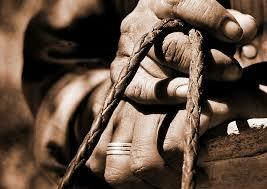 Just like the rope that is all bound up and tangled, we forfeited our purpose because of our entanglements (Heb. 12.2). We were made to reflect God, but now we live to glorify ourselves. Filling the earth was supposed to be fun, now it involves pain (Gen. 3.16; and all the moms say amen!) We were made to work, but now we toil (Gen 3.17). We were meant to Rule the earth and steward it, now it produces thorns and thistels and serecia lespedeza that no matter how many times you walk and spray your fields with 24D it wont die (Gen 3.19). We were meant to rule the animals, but we listened to the snake. There is a massive schism between us and God called sin (Isaiah 59.1-2) and there is issues between us and each other. Everything about what we were created for has changed because of our disobedience. But just like a rope, when the knots get removed, it returns to its form, its shape, its purpose. In the midst of this change, is the first propehcy of Jesus: “And I will put enmity between you and the woman, and between your offspring and hers: he will crush your head and you will strike his heel.” (Gen 3.15) This is the first step in God’s plan of getting our rope unknotted. This is God’s first step in saving us from our sins. When Jesus came in the New Testament, saw the unused ropes lying around, he took it upon himself to restore us, to restore our purpose, to restore our relationships, and make us useful once again! “God demonstrates his own love in this: While we were still tangled up, Christ died for us!” (Romans 5.8) The rope was made to catch calves, but a tangled rope wont ever know the joy of doing what it was made to do. Go to God and let him fix the problem. Rough Stock riders have the best stories. One of my favorite activities at youth rodeos is to watch the roughies interact and go about their business. Whether a kid rides bulls, sheep, steers, or calves, they all have the same walk: “the bullriders limp”. When asked, they will assuredly be able to give you an account of the size, type, and temperament of the animal and how they came to acquire their limp. Young bullfighters are the same way. Daniel and I’s help at the youth rodeos, Judd “the Stud” Pope, age 7, is always beat up from some hooky calf or temperamental steer. He is usually nursing some kind of injury that always has as story behind it. Ropers are the same way when they talk about their horses. Every roper has a story about them and their horse, an injury that their horse has overcome, or a quick run made possible by the horsepower they ride. That being said, older rodeo contestants aren’t any better. We all have stories about rides, runs, animals, and traveling partners. 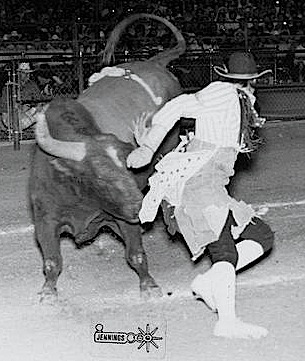 My favorite stories to tell, be it injuries, travels, or accomplishments, seem to have rodeo as a backdrop. 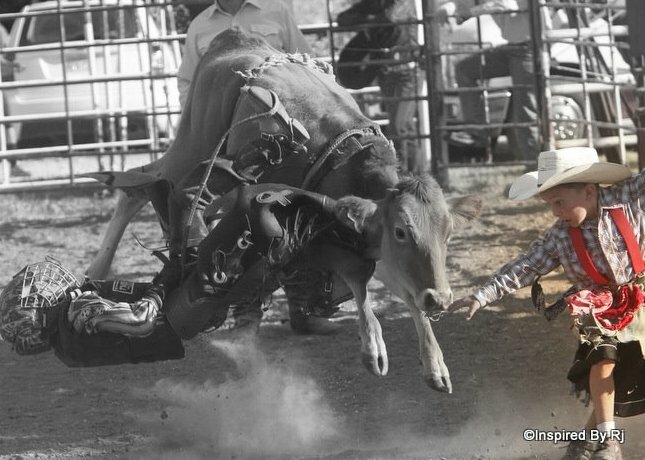 Rodeo People are proud of their stories…and more Christians should be! Stories are deeply personal and intimate. Stories communicate our character, reveal our passions, and express our emotions. When someone tells you their story, you know what makes them tick. The men of Scripture knew this. The Bible begins with 10 toldoth’s (heb. “this is the account of ________”) in the book of Genesis. These “accounts” are the stories of what brought Israel into Egypt, a story that Moses was very familiar with telling. David, when trying to persuade Saul to let him fight Goliath, doesn’t offer him an itemized list of his strengths, but tells Saul his story: “Your servant has been keeping his father’s sheep. When a lion or a bear came and carried off a sheep from the flock, I went after it, struck it and rescued the sheep from its mouth. When it turned on me, I seized it by its hair, struck it and killed it…The Lord who delivered me from the paw of the lion and the paw of the bear will deliver me from the hand of this Philistine.” (1 Sam 17.34-35, 37) Paul, when on trial, summons his chief witness of God’s power, himself, and tells his story before King Agrippa (Acts 26) and an angry crowd (Acts 22). Scattered throughout his Epistles, Paul inserts his story into key places to connect with his audience, to spread the gospel, and to illustrate his teaching. In 2 Corinthians he discusses his struggles (2 Cor. 11.16-12.10) and Galatians its his receiving of the gospel (Gal. 1.11-24). In Ephesians 3 he argues for the grace and message given him (Eph 3) in the same way he criticizes confidence in the flesh in Philippians 3.4-10. With the Thessalonians he makes it clear that he set an “example” for them, a “model” for them to follow. (1 Thes. 1.5;2.9; 2 Thes. 3.7-9). And with Timothy he doesn’t even need to tell the story, because like all good wingmen, Timothy was with him for much of them. (2 Tim 1.13; 2.2; 3.10-11) Paul’s story gives guidance to his message, background to his teaching, and insight to his words. But there is one thing it cant do. Our stories have the ability to bring people closer to God, to challenge them to follow Christ closer, and to give hope to those struggling. Our stories bring color to the message we live out and preach, amplification to God’s interaction with man, and testimony to a life lived with God. Our story is a powerful tool that God can use…but only if we know it, if we own it. I challenge you to put it into words. Attached to this post is a handout on how to effectively articulate God’s work in our lives. Take some time this week, as a devotional exercise, to put your story onto paper. Someone might need your story (God’s story in your life) this week! When I hopped in the truck at sun-up this morning, my phone read -8 degrees. I turned the key and felt the warm air hit me in the face and had never been happier that I didn’t have a ranch to take care of. Yesterday, while I sat in my living room under a blanket, I saw pictures of guys, in blizzard like conditions, taking care of their animals, doctoring calves, and driving the feed truck with the windows down. I have been in those situations, the cold, the snow, and the rain, and I say this with the utmost respect, but I’m glad it was they and not I this day. There wasn’t a choice. Animals need to be fed and watered. Calves need to be checked and doctored. There is no putting-off-until-tomorrow, no out-sourcing or contracting-out. When it comes to days off, there are none. Hard work is what makes them who they are. Hard work is something that Paul made a focal point of his ministry. Paul lived out the proverb: “Lazy hands make a man poor, but diligent hands bring wealth.” (Proverbs 10.4) In Corinth he split time as a tentmaker and preacher (Acts 18.3). In Thessalonica he “worked night and day, laboring and toiling so that we would not be a burden to any of you.” (2 Thess. 3.8) Its clear from reading through the letters to the Thessalonians, the Paul expects them to follow his “model” (1 Thes. 3.9) and their “example” (1 Thes. 3.7). As I was looking at facebook and reading through Thessalonians, I was reminded of the verses that I want my life to reflect. I want to live out Paul’s command in 1 Thessalonians 4.11-12: “Make it your ambition to lead a quiet life, to mind your own business, and to work with your hands, just as we told you, so that your daily life may win the respect of outsiders and so that you will not be dependent on anybody.” Paul understood that our ability to work was part of our being. (Gen 2.15) I know people who hit the big bucks by suing a company. I also know others who put down hours they don’t work. I have seen laziness first hand, and can’t stand those who refuse to give their best. Paul would tell us “to never tire of doing what’s right.” (2 Thess. 3.13) In a previous life, this tiring of doing right killed me. I struggled to remain diligent in my work as I watched others around me. I want to get better at this…regardless of what is going on around me, continuing my work regardless of my surroundings. So to you farmers and ranchers out there who work tirelessly, thanks for your example. For those of you who give your best every day, thanks for living out scripture. Hard work is essential to the Christian life and there are few things better than a hard days work. It is imperative, that we as disciples, live our lives, do our work, in a way that people look at us and are encouraged. Do we work in this way? Are the people we work alongside encouraged because of the effort we give? I want to be the kind of guy that Paul was thinking of in Thessalonians…and if I’m not, I sure aim to be!